NOTE: The photograph above is not from an actual production of THE WIZARD OF OZ at Melody Top. Instead, it is from a magazine ad promoting the 1985 season. 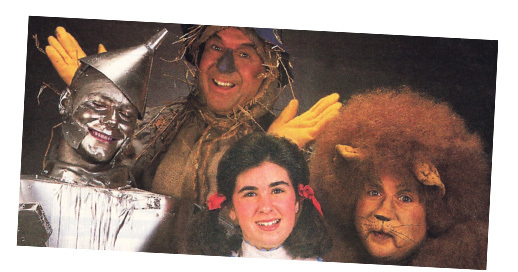 In this photo, producer-general manager Guy S. Little, Jr. is The Scarecrow, marketing director Dan Dahl is The Cowardly Lion and marketing assistant Bill Peot is The Tin Woodman. Kari Greenberg posed as Dorothy for this picture, while Andrea McArdle played the role in the production. Visit the photographs page for more information on this show! All rights reserved. Memories of Melody Top is a non-commercial, information-only website created solely for historical purposes. The webmaster strives to present true and honest information to those online who express a genuine interest in Milwaukee's Melody Top Theatre. Information was collected from many different sources, with careful consideration to both copyright and trademark laws. If you believe information on this site is incorrect or inappropriate, please contact the webmaster immediately. Personal privacy is a strict concern. Every effort will be made to correct a mistake or to remove illegal data, in a timely manner.